Architectural rendering of the Chrysalis amphitheater to be constructed in Columbia, Maryland. Click for a higher-resolution version. Image © 2015 Marc Fornes; used with permission. tl;dr: As construction of the Chrysalis amphitheater begins, I look again at the structure and its architect. 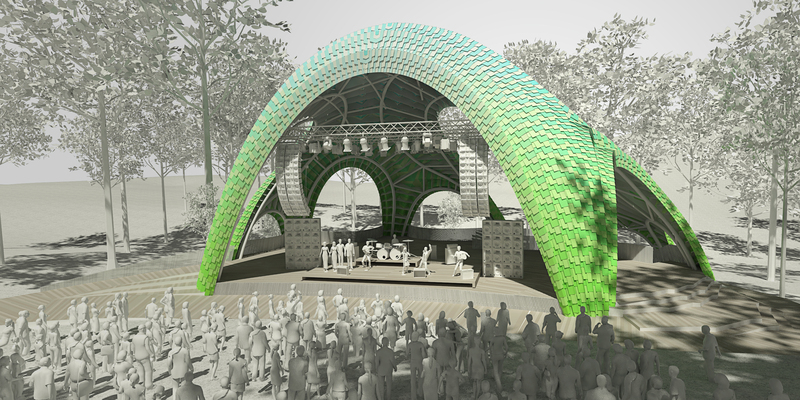 Tomorrow is the groundbreaking ceremony for the Chrysalis amphitheater, the first element of the Inner Arbor plan to be constructed as part of the planned Merriweather Park at Symphony Woods. In the coming weeks and months I hope to be able to go into more detail about the Chrysalis and its construction, but for now I thought it would be nice to both summarize the current state of the Chrysalis and discuss where it stands in the overall body of work by its designer, Marc Fornes, and his firm THEVERYMANY. The overall form of the Chrysalis has not changed since the very first post I devoted to it, but the exact way it’s put together has been refined since then. As I noted in my second article on the Chrysalis, its surface is created using a technique employed by Fornes in his other work: a curved surface is generated by computer and then instantiated by riveting together thin plates cut from flat sheets of the chosen material (in this case aluminum). The individual plates are each painted a given color, and the juxtaposition of plates within the overall structure then produces its final appearance. As can be seen in the picture above, the individual plates are relatively small (perhaps a square meter or two in the case of the Chrysalis), so creating the entire Chrysalis surface will require at least a thousand of them (in my estimation). 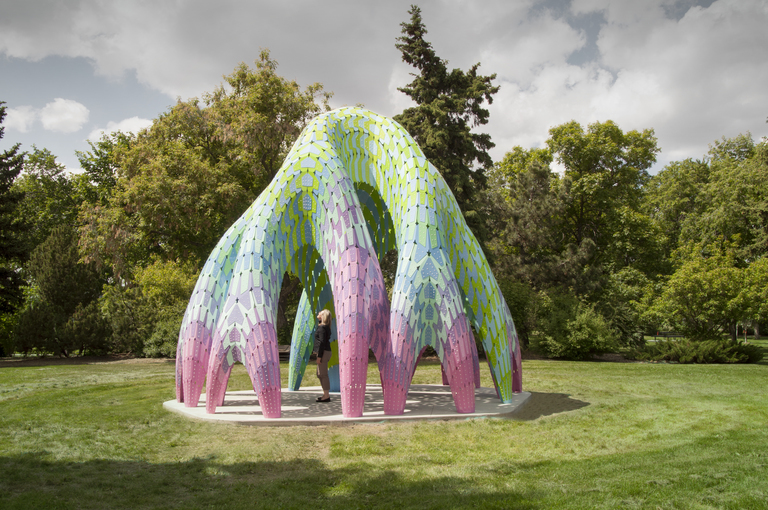 “Vaulted Willow” public sculpture in Borden Park, Edmonton, Alberta. Click for a higher-resolution version. 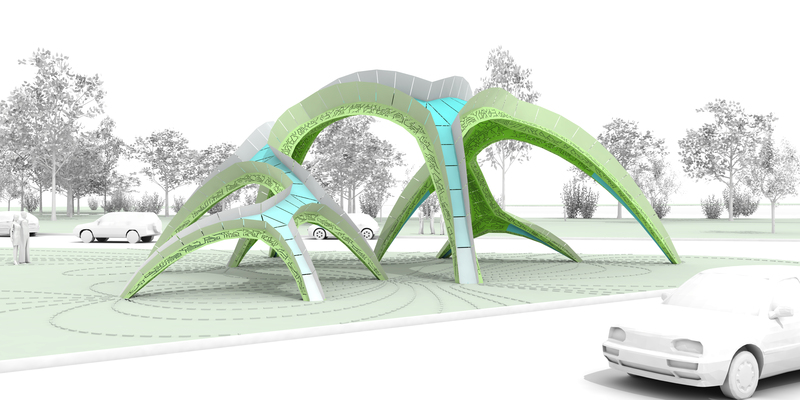 Image © 2015 Marc Fornes; used with permission. The Chrysalis is to my knowledge the largest structure Fornes has designed to date, and as such presents challenges beyond his earlier designs. Compare it for example to “Vaulted Willow” (more informally known as the Willow), a public sculpture in Borden Park in Edmonton, Alberta. Vaulted Willow is a relatively small structure at about 20 feet tall (note the person standing under it in the picture). It is not designed to bear any weight other than itself, and thus the surface of riveted plates can be self-supporting with no other associated structural framework required. “Over Path” public sculpture planned in Woodlawn Lake Park in San Antonio, Texas. Click for a higher-resolution version. 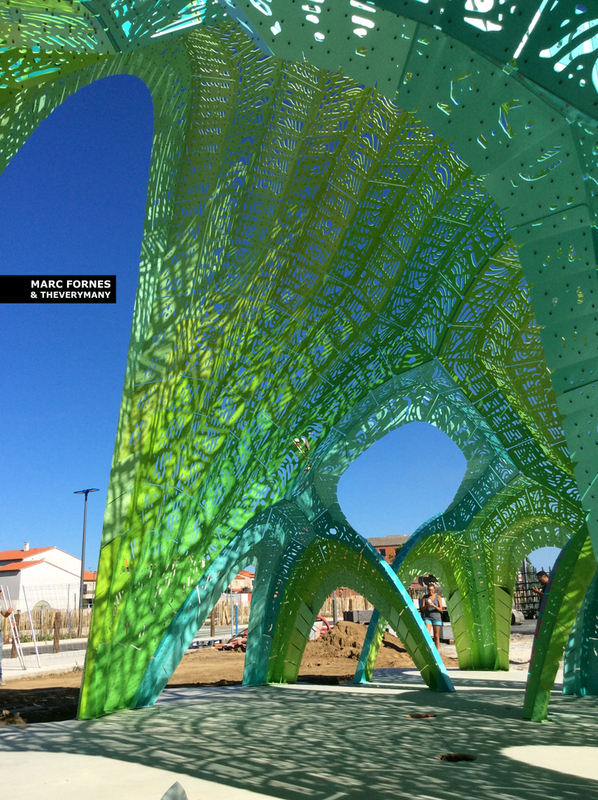 Image © 2015 Marc Fornes; used with permission. Amphitheater at Lycée Christian Bourquin in Argelès-sur-Mer, France. Image © 2015 Marc Fornes; used with permission. The Argelès-sur-Mer structure can be thought of as the little brother of the Chrysalis. The Chrysalis is considerably larger, and as a full performance stage must support lighting rigs and speaker stacks not found in its smaller and lighter sibling. Unlike the Argelès-sur-Mer structure the Chrysalis is also designed to keep rain off the performers or the audience (when seating is provided on the stage itself), so its surface is solid rather than perforated, and hence relatively heavier. The combination of these factors necessitates providing a supporting framework under the outer shell of the Chrysalis, as seen in the above graphic. Altogether the Chrysalis occupies a special place in Fornes’ body of work, as (to my knowledge) it’s the first time he’s taken his design and manufacturing techniques and applied them to a truly large-scale commission. In so doing I think there are both losses and gains: The sheer size of the Chrysalis means that it does not have the same human scale of pieces like Vaulted Willow, and the need to support theatrical equipment and protect it and the performers from the weather means that it does not have the same degree of lightness and delicacy found in Over Path and the Argelès-sur-Mer structure. However the Chrysalis is still considerably lighter and more graceful in form than typical conventional amphitheaters, and will provide both an attractive and functional performance space for Merriweather Park at Symphony Woods. I’ve previously mentioned that Marc Fornes is a very promising young architect, and bids fair to become a major one. In the coming years I anticipate he and his firm further refining his innovative techniques and becoming more skilled in applying them to architectural structures well beyond the sculptures, installations, and experimental pieces of his early career. I’m thus sure we will see works from him even better than the Chrysalis, but at the same time we have the satisfaction of having one of his first major structures almost in our very backyards. Please join me and others tomorrow morning at 10 am to help celebrate the beginning of its construction. Yet another indication that the Inner Arbor Trust did a good job of selecting its design team.